OTTAWA, Ontario, Canada, July 1, 2016 (ENS) – Canada’s Federal Court of Appeal Thursday overturned the permits for Enbridge’s controversial Northern Gateway Pipelines project after the court found that the government of Canada failed to consult the First Nations affected as required by the Constitution. The majority ruling was signed by two of the three judges on the Appeal Court panel. Judge C. Michael Ryer wrote a dissenting opinion, finding that the government had adequately consulted with First Nations, Canada’s aboriginal people. The decision came in a lawsuit brought by a coalition of seven First Nations, four environmental organizations and one labor union. Others were more hopeful. “Today’s ruling shows what the people have been saying all along – this pipeline will never be built. This is a victory for our climate, our coast and for First Nation’s communities in determining their own future” said Sven Biggs, of Stand, formerly ForestEthics, one of the coalition groups. 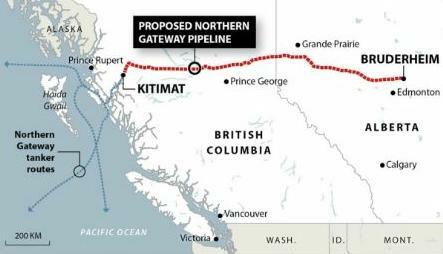 The Enbridge Northern Gateway Pipelines is a project to build a 1,177 kilometre-long twin pipeline from Bruderheim, Alberta to the deep-water port of Kitimat on the northern coast of British Columbia. The eastbound pipeline would import natural gas condensate and the westbound pipeline would export diluted bitumen from the Athabasca oil sands to the marine terminal in Kitimat for transportation to the Asian markets by oil tankers. The C$7.9 billion project was proposed in mid-2000s and has been postponed several times. 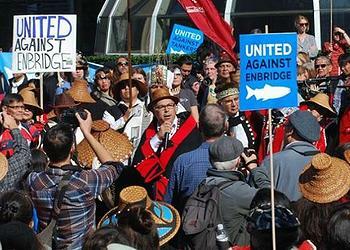 The project would be developed by Enbridge, Inc., a Canadian crude oil and liquids pipeline and storage company. In June 2014 the Northern Gateway pipeline project was approved by the Canadian government headed by Conservative Prime Minister Stephen Harper, subject to 209 conditions. 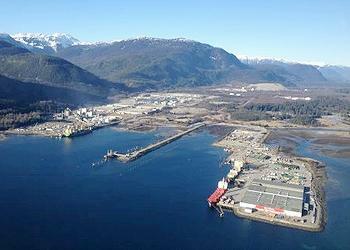 Upon taking office in 2015, the new Prime Minister, Liberal Justin Trudeau, imposed a ban on oil tanker traffic on the North Coast of British Columbia, putting a nail in the project’s coffin. Their traditional territory includes the waters that would be used by tankers, the Kitimat terminal and some of the land the pipeline would cross.